So far we have constructed a meta-model for our electrical-circuit domain. It enabled us to create models that resembles circuits. Up to this point though there is no actual meaning to the circuits. As humans we can infer certain properties from these circuits, but the models themselves don’t impose any particular interpretation. The meta-model infers the structural semantics, but no behavioural semantics. There are many potential interpretations and interpreters of our circuit models. In this tutorial we will focus on generating Modelica code that can be used to simulate the dynamic behavior of the circuit in question. In webgme the typical extension point for writing interpreters are plugins. The plugin framework and API are designed to enable both server- and browser-side execution of the same code. At the point where a plugin is executed it will have access to the context it was invoked and through various webgme APIs; Core, Project, BlobClient etc. ModelicaCodeGenerator - Responsible for traversing model hierarchy and extract the data needed for generating Modelica code corresponding to the circuit being interpreted. SimulateModelica - Responsible for invoking a Modelica tool that can simulate the dynamical behavior of the circuits. This plugin will also be responsible for communicating back the results to the users. There a couple of reasons why this is a favourable division. To generate the Modelica code there is no restrictions on where the plugin is executed. The server does not have to have any 3rd party dependencies installed (or have any connected workers with available resources) and the plugin can even run in the browser. For some deployments restricting the set of features to only generate the Modelica code might be favorable. When it comes to writing tests it is typically also easier to divide functionality into separate implementations. We will start with the ModelicaCodeGenerator here and continue with the SimulateModelica in the Integrating Analysis Tools section. This json-structure contains information about the plugin and is used by the GUI and plugin-framework. Details about what goes in here is explained in the wikipages. This is the outline of a mocha test suite for the plugin and shows how to build up a test context and invoke a plugin from a unit-test. You might also have noticed that the config/config.webgme.js was modified… In order for the webgme plugin framework to find our plugin the path to it is added to the configuration file. Note that both config.default.js and config.test.js load and reuse the added configuration parameters from this file. This script is called by the plugin-wrapper, ModelicaCodeGenerator.js, which passes down the plugin context via arguments. This file can be used as the entry point when debugging the python portion of the plugin. This is where the implementation of the plugin logic goes. The ModelicaCodeGenerator-class is imported and used from both run_plugin.py and run_debug.py. For an overview of how the python bindings is connected, go to the webgme-bindings repository. The Python API is generated in snake_case rather than camelCase and is completely synchronous so there’s no need to deal with callbacks or promises. When following this tutorial keep this in mind and more importantly use the load* equivalents to get*path, e.g. loadChildren-vs-getChildrenPaths and loadPointer-vs-getPointerPath. The generated plugin is available from the browser and the server, however in order to present it to the user on the GUI, we must register it at the appropriate nodes. In our case we want the ModelicaCodeGenerator to be invoked from nodes of meta-type Circuit so we edit the value at the meta-node and the registered value will propagate down the inheritance chain to all Circuits. At this point we have the context setup up for our plugin. 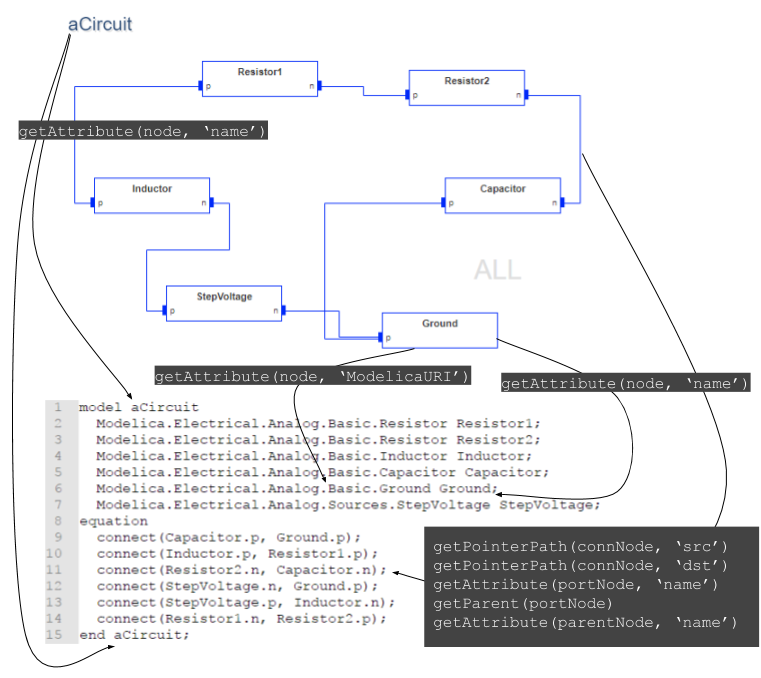 The activeNode for the plugin will be a Circuit and all nodes in the sub-tree are pre-loaded in a map where keys are the path (a unique id) to the nodes and values are the node objects. To extract data from the model we will be using the Core-API, and it’s highly recommended to read the section on how to use the API at the link. The first video shows how to iterate over the children of the Circuit and check their meta-type. Important concepts here are; self.META property of the plugin which is a mapping from the name of a meta-node to the actual core-node, and the helper-method isMetaTypeOf which checks if the first node is of type of the second node. Next we need to implement the extraction of the data we need in order to generate the Modelica code. For this we will implement two helper functions that populates the modelJson.components and modelJson.connections array respectively. At the end we will serialize the data using the standard built-in JSON.stringify function. After generating the modelica file we would like to make it available for the user to download. Webgme provides a storage for files through the blob-storage. In the video below we will show how to upload the generated file onto the storage and how to provide a download link to the invoker of the plugin.